Queens Beach is Bowen's most northern seaside suburb. It is located just five kilometres from the Central Business District and offers a relaxed environment with lots to see and do. Queens Beach Tourist Village is nestled amongst seven acres of award winning garden sites, just a short stroll to a beautiful sandy beach, playgrounds, seaside golf course, walking track with exercise equipment along it, tennis courts, lawn bowls, medical centre, cinemas, hotel, TAB, takeaway and convenience store. Everything you need is at your fingertips. The park offers accommodation in the form of near new self-contained ensuite cabins that cater for tourists, families, disabled guests and corporate workers alike. Overall, it is a park with plenty of room for the caravan, motor home and camping enthusiasts too. You or the family can relax and refresh in or around the crystal clear swimming pool or in the cool of a shady tree. 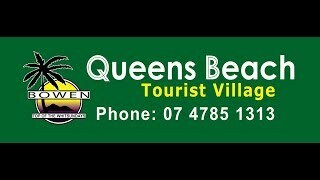 The Queens Beach Tourist Village has built its reputation on providing an experience that is fun, friendly, relaxed and welcoming. Please feel free to make an enquiry. The park has two purpose built Disabled Friendly Deluxe Ensuite Cabins with ramps leading up to a timber deck. The bathrooms in particular have appropriate fittings installed to make the job that much easier for those that need it. These cabins are just that little roomier than others with two king single ensemble beds and a sofa lounge that can either be appreciated for its comfort or folded out to sleep others on a double bed with an inner spring mattress. They each have a split system air-conditioner, larger 200 litre capacity fridge, microwave, 81 centimetre television with DVD player, ceiling fan, electric frypan, cutlery and linen provided to the king single beds. The budget ensuite cabin is perfect for those overnight stays. It is a neat, smaller cabin with a double bed and a set of double bunks for the kids. It is located nearest the pool which is ideal for keeping an eye on the kids or sneaking in for a quick dip yourself as if it were your own private pool. It too is self-contained with an air-conditioner, 200 litre capacity fridge, microwave, 51 centimetre television, ceiling fan, electric frypan, cutlery and linen provided to the main bed. Their Poolside Ensuite Cabins are ideal for the travellers, weekenders and those with smaller families. They are equipped with all the self-contained mods and cons of the other cabins and have a queen bed and a set of double bunks with good quality inner spring mattresses. These cabins also have a timber deck, perfect for reading a book and overlooking their crystal clear swimming pool. They each have a split system air-conditioner, larger 200 litre capacity fridge, microwave, 51 centimetre television, ceiling fan, electric frypan, cutlery and linen provided to the main bed. dine at the nearby hotel or cafe. The choice is entirely yours. The cabins each have a split system air-conditioner, larger 200 litre capacity fridge, microwave, 51 centimetre television with DVD player, ceiling fan, electric frypan, cutlery and linen provided to the queen bed. Their Deluxe Ensuite Cabins are just that little roomier than others and have a sofa lounge that can either be appreciated for its comfort or folded out to sleep others on a double bed with an inner spring mattress. They each have a split system air-conditioner, larger 200 litre capacity fridge, microwave, 51 centimetre television with DVD player, ceiling fan, electric frypan, cutlery and linen provided to the main queen bed. Most of these cabins have their own barbecue. The disabled are catered for in two modern deluxe cabins with ramps leading up to a timber deck. The bathrooms in particular have purpose-built fittings installed to make the job that much easier for those that need it.